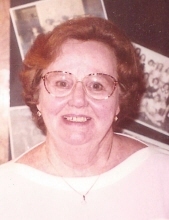 Margaret M. Keltos, 92, a former Westchester County resident, passed away on Tuesday, February 5, 2019, at St. Luke's Hospital in Newburgh. Born May 8, 1926 in New York City, she was the daughter of the late William and Frances Grogan Howe. On June 8, 1946 in St. Bartholomew's Church, in Elmhurst, NY, she married George J. Keltos. Her husband of sixty-one years predeceased her on September 19, 2007. After raising a family, Margaret worked for the Pleasantville School District for many years until her retirement. She enjoyed going to her bridge group and travelling, especially on cruises and her memorable trips to Rome, England, and Ireland. She is survived by her three sons, Robert Keltos and wife, Irene, of Lake City, Florida, Ken Keltos and wife, Debbie, of Poughkeepsie, and Tom Keltos of Torrington, Conn.; three grandchildren, Jennifer Keltos and husband, Ben, of Poughkeepsie, Kerry Keltos of Hamden Conn., and Brian Keltos of Torrington, Conn.; sister, Mickey Coan of Charleston, SC; and several nieces and nephews. In addition to her husband, Margaret was predeceased by a sister, Evelyn Veronesi; and two brothers, Bill and Edward Howe. In accordance with her wishes, cremation has taken place. Memorial calling hours will be from 11 am to 2 pm, Saturday, February 23rd at Sweet’s Funeral Home, Rte. 9, Hyde Park. A prayer service will be conducted at 1 pm during the visitation. Fr. Patrick Curley will officiate. Burial of Margaret’s ashes next to her husband in Calverton National Cemetery will take place in the Spring. To plant a tree in memory of Margaret M. Keltos, please visit our Tribute Store. "Email Address" would like to share the life celebration of Margaret M. Keltos. Click on the "link" to go to share a favorite memory or leave a condolence message for the family.